GLENDALE, Ariz. (AP) — The first time Christian Kirk returned a punt in college, he took it back for a touchdown. He almost did it again on his first touch in the NFL. “I was thinking to myself ‘It’s happening again,'” the speedy Arizona rookie said. 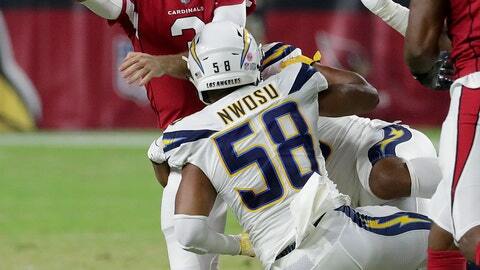 He slipped making a move, against the punter (a former college teammate) no less, but the 38-yard return set up a touchdown drive in the first-team offense’s only series of the game, and the Cardinals beat the Los Angeles Chargers 24-17 in their preseason opener on Saturday night.